Is it possible that the President of the United States of America can’t keep track of which companies he’s bailed out and how they are doing? It’s good to see that President Obama was wrong about gender-bias in corporate leadership. In January, he cited statistics that women earn less than men in the same jobs. But General Motors has announced that its CEO, the first woman top executive of a car manufacturer, does not, in fact, make less than her male predecessor, but makes considerably more. And good for her! 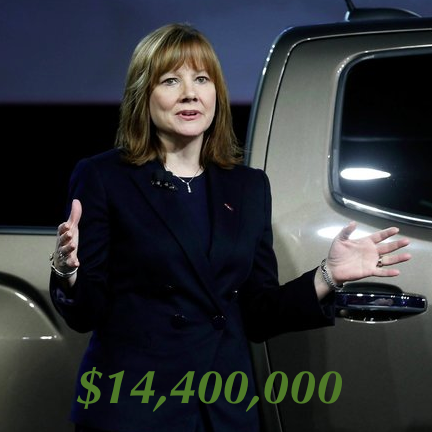 Mary Barra, with certain goals met and incentives, could take home a cool $14.4 million in 2014, as compared to Daniel Akerson’s $9 million last year. What glass ceiling? What gender gap? None here. The president misstated the facts. Or, at the least, he forget to check the status at the Detroit auto maker he helped to bail out. Should she get paid less money?